Some time ago I bought several cones of 2/26s wool mill ends, not really realizing what a thin yarn it is. 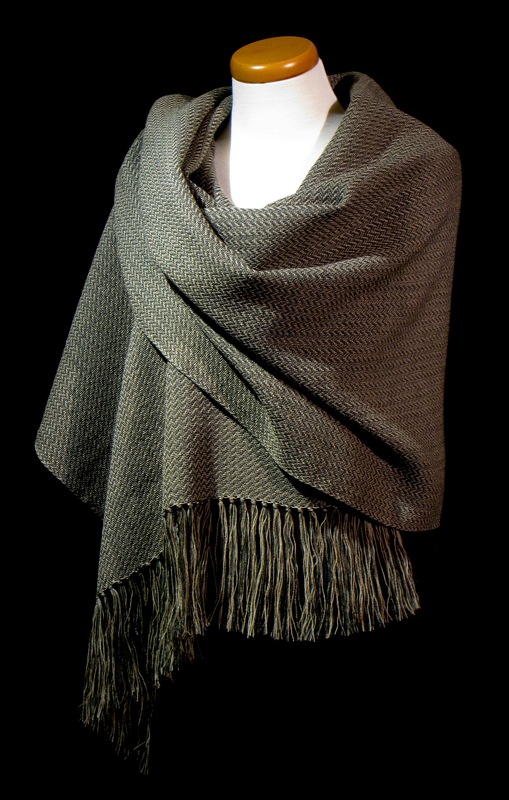 With so much of it on hand, the only thing to go for was a shawl. Originally, I thought to do a flattish waffle weave to give it some texture, and I started warping based on that idea, alternating 6 ends of each color (dark green and tan). Somewhere in the middle of the warping process I tested the yarn for strength, and it broke very easily. Oops – maybe not the best for waffle weave with its longer floats (although I later considered that this yarn is used in mills on commercial looms, so must have some durability). I did a search and found that someone had used this yarn for 2/2 twill at 34 epi, and said it was very easy to work with. I found a nice 2/2 twill structure (Dixon p. 216), and continued warping for that, alternating the colors one to one for a shadow weave. This all took a while because there were a total of 796 ends. 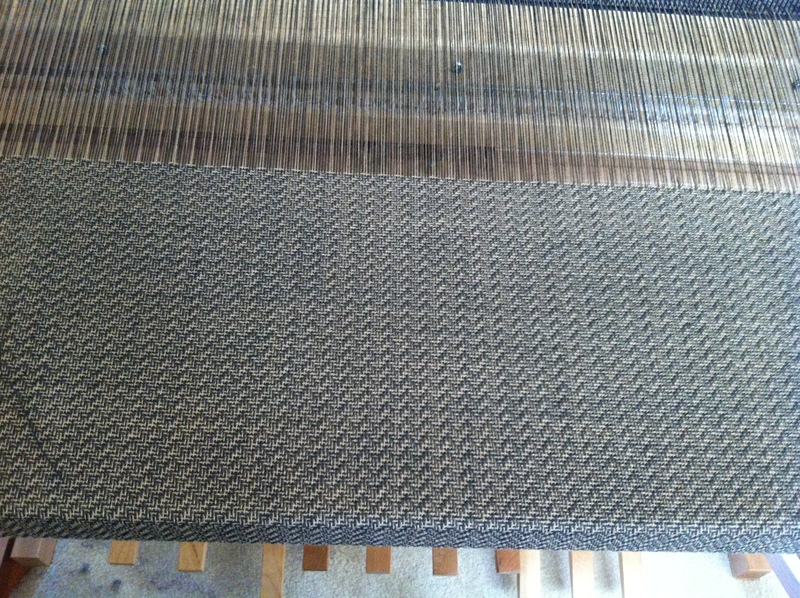 Here’s how the warp looked with the change of structure in the middle. I was pretty sure I could still thread alternating the colors one to one, creating slightly crossed threads behind the heddles, and that turned out not to be a problem. The biggest issue was that the wool yarn was a little sticky, so the weaving was slow, with a lot of warp strumming between picks. 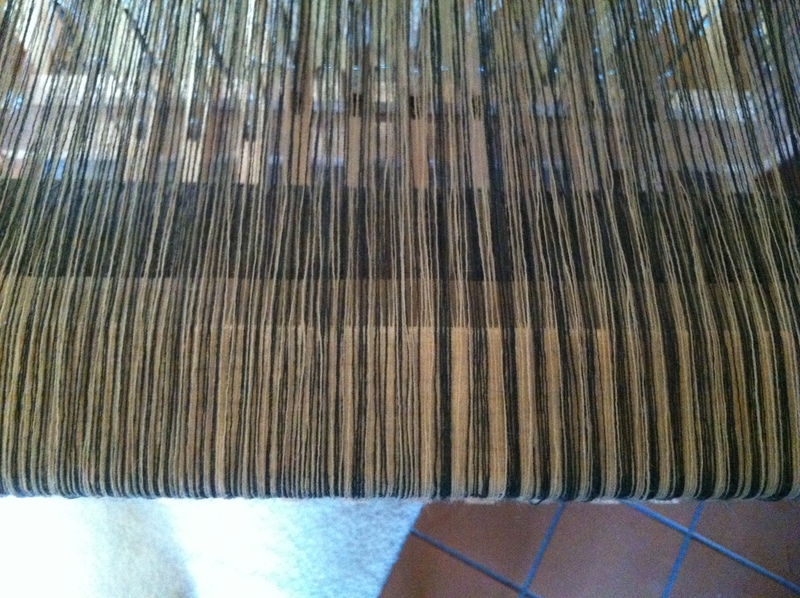 Off the loom, there were some skipped threads to fix, but not too many. The fringe is about 4 inches, and I just left it loose – it sticks to itself, but it adds some interest. I hand washed in very hot water with medium agitation, and let sit until the water cooled. Dried flat. It softened up a bit, and the shrinkage was only about 4%. Finished dimensions 76″ x 21.25″. There didn’t seem to be significant fulling, but the cloth definitely holds together.